The left likes to claim they are ‘inclusive and tolerant’ but their actions always speak louder than their words. Time and time again you see examples of the vitriol, hatred, and violence from the left towards anyone who doesn’t agree with their ideology. So much for tolerance and inclusivity. 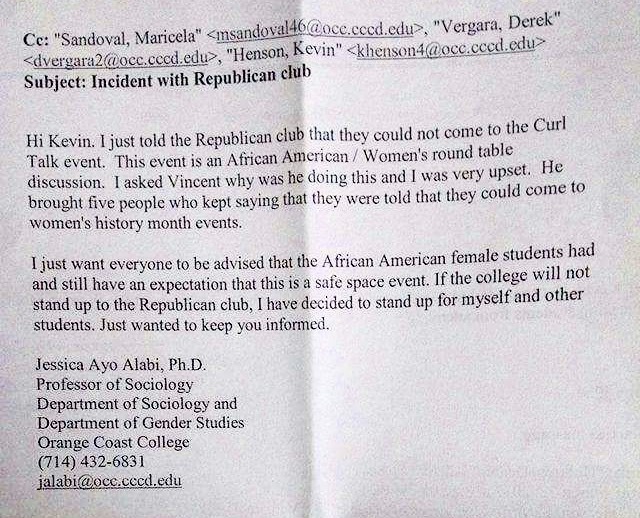 The Orange Coast Republicans Club have filed a formal complaint against Orange Coast College professor Jessica Ayo Alabi for preventing Republican students from attending public events on campus. According to the club, three of its members were shut out of the African-American/Women’s round table discussion in the Multicultural Center hosted for Women’s History Month in March of 2017. That Orange Coast College will take measures to start, or improve, training for faculty and staff on how to respect students’ rights, viewpoints, and be trained on what viewpoint discrimination is to prevent future instances. These colleges waste so much time and money on snowflake causes that when there are actual instances of discrimination, they often go ignored because the students being discriminated against don’t fit the left-wing mold. Why this matters? Every single day there are new stories about the horrifying behavior of leftists on college campuses. Unfortunately, the administrators are often just as bad and do nothing to end it. Colleges and universities used to be a place where students would discuss ideas and be open to diversity in thought. That seems to have taken a drastic turn since a majority of professors are extreme left wingers. Rather than diversity of thought, they promote vitriol, hatred and suppression of those who don’t agree.